Henotheism (from Greek ἑνός θεός (henos theos), meaning 'one god') is the worship of a single god while not denying the existence or possible existence of other deities. Friedrich Schelling (1775–1854) coined the word, and Friedrich Welcker (1784–1868) used it to depict primitive monotheism among ancient Greeks. Max Müller (1823–1900), a German philologist and orientalist, brought the term into wider usage in his scholarship on the Indian religions, particularly Hinduism whose scriptures mention and praise numerous deities as if they are one ultimate unitary divine essence. Müller made the term central to his criticism of Western theological and religious exceptionalism (relative to Eastern religions), focusing on a cultural dogma which held "monotheism" to be both fundamentally well-defined and inherently superior to differing conceptions of God. Friedrich Schelling coined the term henotheism, from heis or heno which literally means "single, one". The term refers to a form of theism focused on a single god. Related terms are monolatrism and kathenotheism. The latter term is an extension of "henotheism", from καθ' ἕνα θεόν (kath' hena theon), meaning 'one god at a time'. Henotheism refers to a pluralistic theology wherein different deities are viewed to be of a unitary, equivalent divine essence. Another term related to henotheism is "equitheism", referring to the belief that all gods are equal. Further, the term henotheism does not exclude monism, nondualism or dualism. 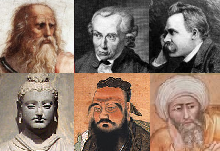 Various scholars prefer the term monolatrism to henotheism, to discuss religions where a single god is central, but the existence or the position of other gods is not denied. According to Christoph Elsas, henotheism in modern usage connotes a syncretic stage in the development of religions in late antiquity. A henotheist may worship a single god from a pantheon of deities at a given time, depending on his or her choice, while accepting other deities and concepts of god. Henotheism and inclusive monotheism are terms that refer to a middle position between unlimited polytheism and exclusive monotheism. Ahura Mazda is the supreme god, but Zoroastrianism does not deny other deities. Ahura Mazda has yazatas ("good agents") some of which include Anahita, Sraosha, Mithra, Rashnu, and Tishtrya. Richard Foltz has put forth evidence that Iranians of Pre-Islamic era worshiped all these figures, especially Mithra and Anahita. Prods Oktor Skjærvø states Zoroastrianism is henotheistic, and "a dualistic and polytheistic religion, but with one supreme god, who is the father of the ordered cosmos". Other scholars state that this is unclear, because historic texts present a conflicting picture, ranging from Zoroastrianism's belief in "one god, two gods, or a best god henotheism". Henotheism was the term used by scholars such as Max Müller to describe the theology of Vedic religion. Müller noted that the hymns of the Rigveda, the oldest scripture of Hinduism, mention many deities, but praises them successively as the "one ultimate, supreme God", alternatively as "one supreme Goddess", thereby asserting that the essence of the deities was unitary (ekam), and the deities were nothing but pluralistic manifestations of the same concept of the divine (God). The Vedic era conceptualization of the divine or the One, states Jeaneane Fowler, is more abstract than a monotheistic God, it is the Reality behind and of the phenomenal universe. The Vedic hymns treat it as "limitless, indescribable, absolute principle", thus the Vedic divine is something of a panentheism rather than simple henotheism. In late Vedic era, around the start of Upanishadic age (~800 BCE), theosophical speculations emerge that develop concepts which scholars variously call nondualism or monism, as well as forms of non-theism and pantheism. An example of the questioning of the concept of God, in addition to henotheistic hymns found therein, are in later portions of the Rigveda, such as the Nasadiya Sukta. Hinduism calls the metaphysical absolute concept as Brahman, incorporating within it the transcendent and immanent reality. Different schools of thought interpret Brahman as either personal, impersonal or transpersonal. Ishwar Chandra Sharma describes it as "Absolute Reality, beyond all dualities of existence and non-existence, light and darkness, and of time, space and cause." While Greek and Roman religion began as polytheism, during the Classical period, under the influence of philosophy, differing conceptions emerged. Often Zeus (or Jupiter) was considered the supreme, all-powerful and all-knowing, king and father of the Olympian gods. According to Maijastina Kahlos "monotheism was pervasive in the educated circles in Late Antiquity" and "all divinities were interpreted as aspects, particles or epithets of one supreme God". Maximus Tyrius (2nd century A.D.) stated: "In such a mighty contest, sedition and discord, you will see one according law and assertion in all the earth, that there is one god, the king and father of all things, and many gods, sons of god, ruling together with him." The Neoplatonic philosopher Plotinus taught that above the gods of traditional belief was "The One", and polytheist grammarian Maximus of Madauros even stated that only a madman would deny the existence of the supreme God. Rabbinical Judaism as it developed in Late Antiquity is emphatically monotheistic. However, its predecessor—the various schools of Hellenistic Judaism and Second Temple Judaism, and especially the cult of Yahweh as it was practiced in ancient Israel and Judah during the 8th and 7th centuries BC—have been described as henotheistic. For example, the Moabites worshipped the god Chemosh, the Edomites, Qaus, both of whom were part of the greater Canaanite pantheon, headed by the chief god, El. The Canaanite pantheon consisted of El and Asherah as the chief deities, with 70 sons who were said to rule over each of the nations of the earth. These sons were each worshiped within a specific region. Kurt Noll states that "the Bible preserves a tradition that Yahweh used to 'live' in the south, in the land of Edom" and that the original god of Israel was El Shaddai. Several Biblical stories[which?] allude to the belief that the Canaanite gods all existed and were thought[by whom?] to possess the most power in the lands by the people who worshiped them and their sacred objects; their power was believed to be real and could be invoked by the people who patronized them. There are numerous accounts of surrounding nations of Israel showing fear or reverence for the Israelite God despite their continued polytheistic practices. For instance, in 1 Samuel 4, the Philistines fret before the second battle of Aphek when they learn that the Israelites are bearing the Ark of the Covenant, and therefore Yahweh, into battle. The Israelites were forbidden to worship other deities, but according to some interpretations[which?] of the Bible, they were not fully monotheistic before the Babylonian captivity. Mark S. Smith refers to this stage as a form of monolatry. Smith argues that Yahweh underwent a process of merging with El and that acceptance of cults of Asherah was common in the period of the Judges. 2 Kings 3:27 has been interpreted as describing a human sacrifice in Moab that led the invading Israelite army to fear the power of Chemosh. Some scholars have written that The Church of Jesus Christ of Latter-day Saints (LDS Church) can be characterized as henotheistic, but others have rejected this stance. Eugene England, a professor at Brigham Young University, asserted that LDS Presidents Brigham Young and Joseph Fielding Smith along with LDS scholar B. H. Roberts used the LDS interpretation of 1 Corinthians 8:5–6 as "a brief explanation of how it is possible to be both a Christian polytheist (technically a henotheist) and a monotheist". BYU Professor Roger R. Keller rejected descriptions of the LDS Church as polytheistic by countering, as summarized by a reviewer, "Mormons are fundamentally monotheistic because they deal with only one god out of the many which exist." In their book, Mormon America: The Power and the Promise, Richard and Joan Ostling, wrote that some Mormons are comfortable describing themselves as henotheists. Kurt Widmer, professor at the University of Lethbridge, described LDS beliefs as a "cosmic henotheism". A review of Widmer's book by Bruening and Paulsen in the FARMS Review of Books countered that Widmer's hypothesis was "strongly disconfirmed in light of the total evidence". Van Hale has written, "Mormonism teaches the existence of gods who are not the Father, Son, or Holy Ghost" and "the existence of more than one god [is] clearly a Mormon doctrine", but he also said that defining this belief system in theological terms was troublesome. Henotheism might appear to be "promising" in describing LDS beliefs, Hale wrote, but it is ultimately not accurate because henotheism was intended to describe the worship of a god that was restricted to a specific geographical area. ^ a b c d e f g Charles Taliaferro; Victoria S. Harrison; Stewart Goetz (2012). The Routledge Companion to Theism. Routledge. pp. 78–79. ISBN 978-1-136-33823-6. ^ Robert Karl Gnuse (1997). No Other Gods: Emergent Monotheism in Israel. Bloomsbury Academic. pp. 132–133 with footnote 6. ISBN 978-1-85075-657-6. ^ a b c d Ilai Alon; Ithamar Gruenwald; Itamar Singer (1994). Concepts of the Other in Near Eastern Religions. BRILL Academic. pp. 370–371. ISBN 978-9004102200. ^ a b c Christoph Elsas (1999). Erwin Fahlbusch, ed. The Encyclopedia of Christianity. Wm. B. Eerdmans. p. 524. ISBN 978-90-04-11695-5. ^ Carl Olson (2007). The Many Colors of Hinduism: A Thematic-historical Introduction. Rutgers University Press. pp. 8–9. ISBN 978-0-8135-4068-9. ^ Brian Arthur Brown (2016). Four Testaments: Tao Te Ching, Analects, Dhammapada, Bhagavad Gita: Sacred Scriptures of Taoism, Confucianism, Buddhism, and Hinduism. Rowman & Littlefield Publishers. pp. 347–349. ISBN 978-1-4422-6578-3. ^ William A. Graham (1993). Beyond the Written Word: Oral Aspects of Scripture in the History of Religion. Cambridge University Press. pp. 70–71. ISBN 978-0-521-44820-8. ^ a b c Jeaneane D. Fowler (2002). Perspectives of Reality: An Introduction to the Philosophy of Hinduism. Sussex Academic Press. pp. 43–44. ISBN 978-1-898723-93-6. ^ James L. Ford (2016). The Divine Quest, East and West: A Comparative Study of Ultimate Realities. State University of New York Press. pp. 308–309. ISBN 978-1-4384-6055-0. ^ Ninian Smart (2013). The Yogi and the Devotee (Routledge Revivals): The Interplay Between the Upanishads and Catholic Theology. Routledge. pp. 46–47, 117. ISBN 978-1-136-62933-4. ^ Jessica Frazier (2013). Russell Re Manning, ed. The Oxford Handbook of Natural Theology. Oxford University Press. pp. 172–173. ISBN 978-0-19-161171-1. ^ Jeffrey Brodd (2003). World Religions: A Voyage of Discovery. Saint Mary's Press. pp. 43–45. ISBN 978-0-88489-725-5. ^ Ishwar Chandra Sharma, Ethical Philosophies of India, Harper & Row, 1970, p.75. ^ Encyclopædia Britannica, 11th edition, Maximus Tryius. ^ Englund, Eugene. "The Weeping God of Mormonism". Dialogue: A Journal of Mormon Thought, 35(1), Spring 2002, pp. 63–80. ^ Bruening, Ari D. and David L. Paulsen. "The Development of the Mormon Understanding of God: Early Mormon Modalism and Early Myths". FARMS Review of Books 13/2 (2001), pp. 109–69. ^ Hale, Van. "Defining the Mormon Doctrine of Deity: What Can Theological Terminology Tell Us About Out Own Beliefs?" Sunstone 10 (Jan. 1985), pp. 23–27.